Finding the cause of middle back pain can be confusing. Before seeing your doctor/chiropractor, understanding the most common causes of back pain can help rule conditions in or rule them out. 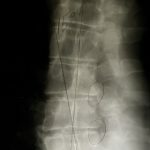 The first cause can be scoliosis. 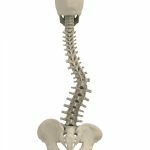 This is a condition causing the spine to bend to the side from the front to back view. This causes middle back pain as a child grows . To check if a child has scoliosis we perform a detailed Chiropractic exam checking posture. Our specific exam looks for EARLY signs of scoliosis. 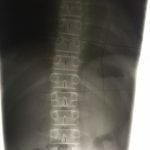 This is Riley’s x-ray of early scoliosis that is NOT detectable from a medical or school exam. This slight curve can progress rapidly with the medical approach’s “wait and see” method of monitoring a child’s posture/x-rays until it progresses to ineffective bracing and risky surgery. From injuries, a person can acquire scoliosis like this man in his 60s who had an injury 20 years ago. This can cause pain later in life, that does not go away. Another cause of middle back pain is nerve pain from the neck to the middle back. This can occur without neck pain. Poor posture is the #1 cause of middle back pain. From living your life with bad posture, your head goes forward and your upper back hunches. This can pinch the nerves in your neck and weaken the back, then middle back pain can occur. After an exam to evaluate your posture, an x-ray allows you to see if you have an abnormal spine causing the middle back pain. These steps will alleviate your middle back pain and CORRECT the problem in your spine causing the pain.